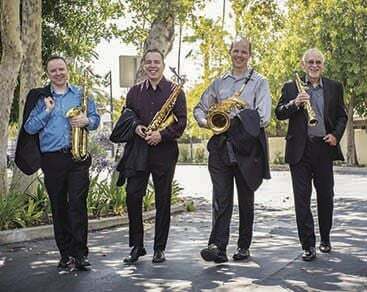 The Encore Saxophone Quartet will close the Antelope Valley Community Concerts Association’s 71st season at 2 p.m., April 14, at the Lancaster Performing Arts Center. Internationally renowned saxophonist Douglas Masek formed the Encore Saxophone Quartet in 1984. The group’s current line-up with Kenneth R. Foerch on alto saxophone, David Brennan on tenor saxophone and Damon Zickon on baritone saxophone, has been together eight years. The quartet’s repertoire spans original compositions and arrangements that bridge styles from classical to modern jazz. Masek plays the soprano saxophone in the group. “I’m just attracted to the sound and the whole idea of the quartet and having the soprano high voice in the melody position,” he said. Foerch and Brennan are two of Masek’s former students. They joined the group when he needed musicians for an upcoming tour, after the other musicians had to drop out. The quartet’s Lancaster Performing Arts Show will include J.S. Bach’s “Little Fuge” in G minor, a transcription originally written for organ. “I’m going to be talking about that particular piece and how it can translate to a saxophone quartet,” Masek said. The second transcription will be Astor Piazolla’s “Tango No. 2.” The piece was originally written for two guitars. The second half of the program contains more jazz pieces and some great American songbook selections. “We’re going to be doing a lot of improvisation in the second half. We’ve got something for everybody,” Masek said. Tickets cost $30 for adults, $27 for military, seniors 62 and older and youth 18 and younger. For details visit www.lpac.org, or call 661-723-5950.